In one week, Hollywood unleashed two, count ‘em, two remakes of films from the 1980’s. Things get really meta in the case of The Thing, as it is a remake of a remake. 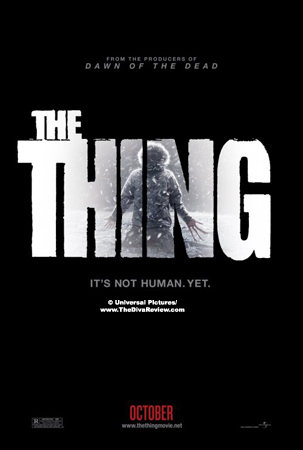 Purporting to be more of a prequel to John Carpenter’s 1982 sci-fi screamer (as opposed to that movie’s predecessor, 1951’s The Thing from Another World), the 2011 version features way too many moments similar to the Carpenter film to be considered on its own merits. That said, between the two eighties remakes (Footloose being the other) The Thing is the lesser of the two. 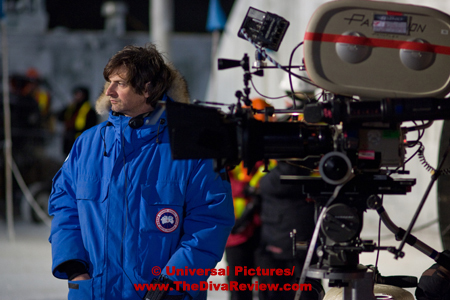 Three Norwegians in an all-terrain vehicle cross the snowy tundras of 1982 Antarctica in search of a distress signal. A cave-in leads them to the source of the signal and a lot more. A metal airship and its frozen inhabitant are the find of the century and Dr. Sander Halversen wants the discovery all to himself. Despite bringing paleontologist Kate Lloyd to the Arctic snow base to give her insight to the find, Halversen proceeds recklessly against Kate’s counsel, unused to following anyone’s advice but his own. Unwise handling of the creature in the block of ice leads to its resuscitation and that’s when the fun begins as the visitor finds a quick and thorough way to acclimate himself to his guest planet. Well, that’s when the fun should’ve begun. Outside of a few shock pops and queasily creepy effects, The Thing is a pretty flat affair. It literally becomes a waiting game to see who’s going to get knocked off next. Paralleling the John Carpenter film, trying to find out who has been cloned by the alien should’ve been a suspenseful thrill: In the 1982 film, there were blood samples taken from each of the crew and a heated paper clip applied to the blood would reveal most violently who was an alien in disguise and who was human after all. Here, we have a very similar scene, but instead of the paper clip test, we’re supposed to be on the edge of our seats as the crew members’ bridgework is checked for metal fillings, which apparently the creature can’t assimilate. It’s that kind of dullness that never allows The Thing to get off the ground. Everything feels rote, tired and unoriginal and not just because this is a remake; there’s nothing here not seen before in plenty of other sci-fi and horror movies. Even the idea of making this version’s hero a woman has been done far better by the likes of James Cameron in Terminator and Aliens. Problematic as well is the fact that Mary Elizabeth Winstead as our heroine, seems to have brought along only one facial expression and one extremely calming tone of voice. Ellen Ripley, she ain’t. I might have enjoyed the film more had it been centered on Joel Edgerton (who’s everywhere these days) and Adewale Akinnuoye-Agbaje as the American helicopter pilots who are the first ones to try and get the heck out of Dodge when things start getting heated. Also, the latter actor was Adebisi from the excellent prison TV drama, Oz, so he knows when trouble’s coming and to get far away. It was odd to see Akinnuoye-Agbaje wearing a wool hat that wasn’t coiled into a small, tight roll and balanced on the side of his awesome head. I might have given the movie another star for that. Back to the dreck; we’re shown one scene during the closing credits that gives us an indication of how the alien makes its way to the crew in the John Carpenter film, but unless one was familiar with that film and the Carpenter-composed theme song, they would be hard-pressed to connect the two. Yeah, it’s just blah. Not horrible, but not good, either. The Thing is yet more ammunition in an increasingly wary public reception for remakes in general and particularly for reduxes of movies less than thirty years old. Just because a film is a remake doesn’t mean you have to bore us all by giving us no surprises.